Transit District Reflects on Water Conservation as Part of Earth Day Observance – Peninsula Moves! While Earth Day comes around once a year, the San Mateo County Transit District incorporates sustainability practices year-round. As California struggles to respond to record-setting drought conditions, the Transit District is eyeing its water usage as another area for sustainability improvements in the coming year. Bus Maintenance – SamTrans’ bus wash systems recycle 70 to 85 percent of the water used. Facilities Maintenance – Water conserving faucet aerators in the bathrooms and kitchens reduce water use by 25 to 40 percent. Central Equipment Maintenance and Operations Facility – At CEMOF, the maintenance team recycles oils and lubricants, and the train wash system recycles 80 percent of the water used. Stations – Caltrain conserves water at stations by using “smart” irrigation controllers that adjust watering schedules based on local temperature and rainfall. Caltrain also uses drought-tolerant vegetation in new plantings wherever possible, and covers plant beds with mulch to reduce evaporation of water. In addition to these efforts, the District will continue to monitor its water use and work with its operations, maintenance, and landscape contractor teams to identify and implement additional strategies for water conservation. The District is also monitoring the development of the State Water Resources Control Board’s regulations to reduce potable urban water usage by 25 percent statewide, as called for in the Governor’s April 1, 2015 Executive Order. 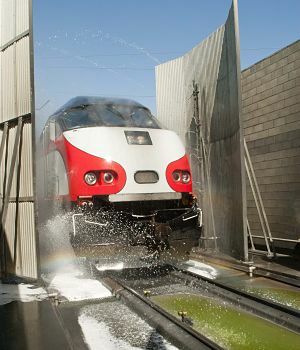 Caltrain is implementing a new Storm Water Management Program to outline how it will prevent the release of pollutants into the storm sewer system. Storm water is the result of rain runoff from developed areas. As the rain drains to sewers that flow to San Francisco Bay, and eventually the Pacific Ocean, it collects and transports trash, chemicals and oil. But unlike the sanitary sewer system, storm water doesn’t go through a treatment plant so pollutants may not be removed before reaching the San Francisco Bay. To learn more about all of the District’s sustainability efforts, visit http://www.samtrans.com/about/Sustainability.html or http://www.caltrain.com/about/Sustainability.html.